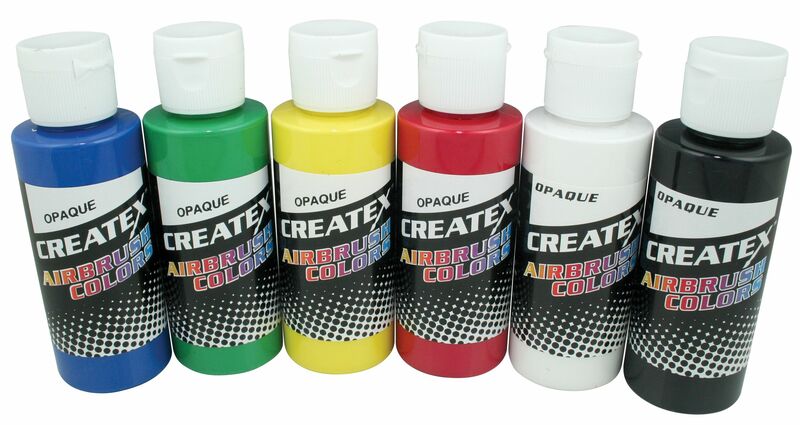 Createx Airbrush Colors are the number one, most widely used and trusted professional airbrush paint in the world. Made with light-fast pigments, durable resins and quality ingredients, Createx works on fabric, wood, leather, canvass, plastics, aluminum, metals, ceramic, clay, poster board, brick, plaster, latex, glass and more. Colors are water-based, non-toxic and meet ASTM D-4236 standards. Set contains 2 oz bottles in 6 colors: Opaque White, Opaque Black, Opaque Yellow, Opaque Light Green, Opaque Red, Opaque Blue.